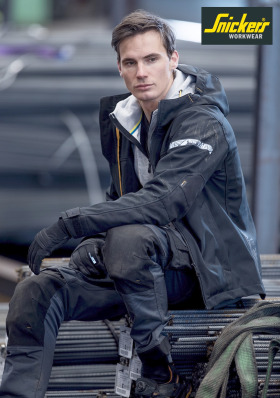 Snickers Workwear is continually improving its working clothes with superb new stretch work trousers and hi-tech jackets, the company says. With great fit and superb value for money, the brand new comfort fabrics woven into Snickers’ newest street-smart work trousers deliver enhanced freedom of movement as well as improved comfort and close quarter mobility. They’re perfectly complimented by the new, Hi-tech range of AllroundWork and FlexiWork jackets. They include 37.5 fabric technology garments for superb working comfort as well as others that are 100% waterproof, plus Hi-Vis working clothes for tradesmen and women that deliver maximum warmth, dryness and visibility when users need it most.